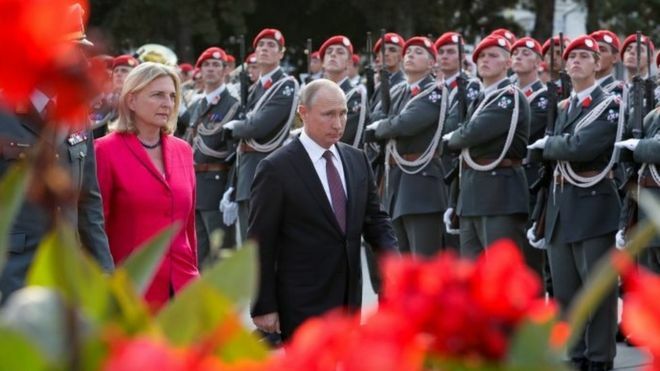 Russian President Vladimir Putin will be a surprise guest at Saturday's wedding of Austrian Foreign Minister Karin Kneissl, Moscow has confirmed, BBC reported. "Yes, he will drop by on the way to Berlin," Kremlin spokesman Dmitry Peskov was quoted as saying by Russia's Ria Novosti news agency. He was referring to Mr Putin's talks with German Chancellor Angela Merkel. Ms Kneissl, 53, will marry businessman Wolfgang Meilinger at vineyard in Austria's Styria state, reports say. Meanwhile, Mr Putin's adviser Yuri Ushakov told Russia's Interfax news agency: "We will call in and congratulate them." The Freedom Party is believed to have links to Russia's governing United Russia party.